Are there any real world examples demonstrating my total time spent charging and driving when using superchargers? If I speed up to say 85 mph, am I going to really save time or not as I will need to charge more at the next supercharger. I had tried to real world test this at one point but then realized how next to impossible it would be to replicate the same drive at different speeds. And I also know how difficult it is to get good charging data from the superchargers. Instead of a real world test, I could use my accurate charging data, which has previously been validated by Tesla personnel and add in EVTripplanner estimates. The supercharger curve data is from a functional supercharger operating without problems and without sharing the supercharger pair with another car. Although the energy given by EVTripplanner is an estimate, many owners have found these estimates quite accurate and will probably be more accurate than any real world test for a lengthy drive. I decided to model the trip from the Harris Ranch supercharger south to the Tejon Ranch supercharger on I-5 in central California, which has a 70 miles per hour (mph) speed limit. This leg is relatively flat 116.2 miles but has an elevation change of 656 feet. Although I could likely find a supercharger to supercharger with no elevation change, I thought this one may be the most useful data as these superchargers are frequented on long routes. Perhaps myself or other owners will report real world data in the future on this leg. The trip was modeled using a 85kWh Model S with 21″ wheels and a 200 pound payload at 72 degrees Fahrenheit in the car and in the cabin. I first graphed the data assuming the driver arrived at the second supercharger, Tejon, with only 1 mile left in the tank. 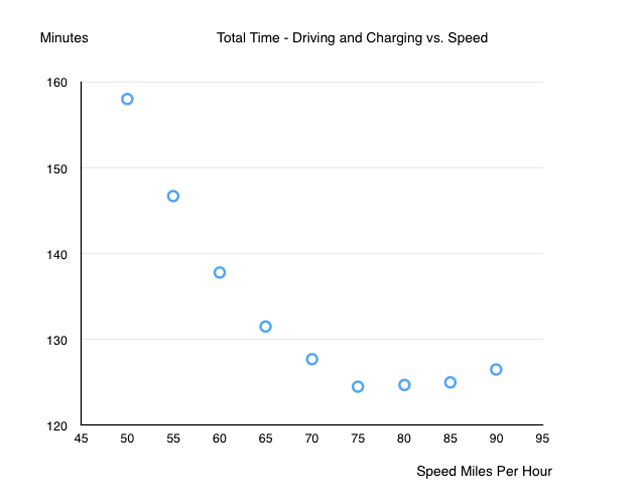 The data compares the total amount of time spent in driving plus charging in minutes versus the speed in mph. Each charge was only to replenish the battery with the number of rated miles spent during the journey. At 70 mph, the 116.2 mile trip from Harris to Tejon used 151 rated miles, at 75 mph 163 rated miles were used. 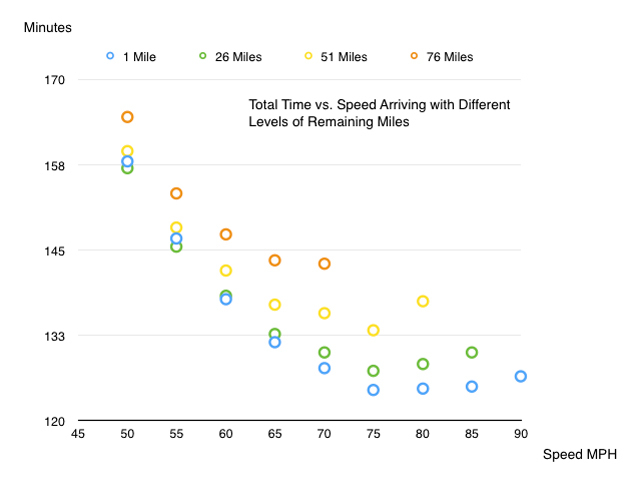 In looking at the data, you quickly notice that your overall time spent on the road is the fastest at 75mph. By increasing the speed to 80 or 85, you will essentially spend the same total elapsed time! The total time of 75, 80, and 85 mph are all within one minute. Going really fast at 90 actually slows down your total time because of increased time needed to recharge the battery as the energy usage increased dramatically. So at very high speeds, the car is simply wasting energy and not saving the driver any time. Here is the actual data in table format. The total energy used increases as speed increases and driving time falls but the charging time increases. The maximum effective mph is 56 mph, where time includes both driving and charging time. The next question is what is the impact on having a battery partially full when I arrive at a supercharger. I plotted the difference arriving at Tejon with a battery with 1, 26, 51 and 76 miles remaining. What is notable about this second graph is that the difference between arriving at a supercharger with 1 or 26 miles is not that significant. Arriving to Tejon with 26 miles left in the tank only uses an average of 2 minutes more. With 51 and 76 miles in the tank, that delay increased on average by 6 and 10 minutes. I could not predict the data for the higher speeds and the higher charge levels because my supercharger data does not go to a full 100% range charge. But even these slower total numbers are less than 10% of the total time. I do not have the oldest A battery but I do have the 21” wheels, which are slightly less efficient. The numbers for the A battery and a 60 kWh battery will be slower. I generally prefer to arrive to a supercharger with around 25 miles left in the battery. This strategy gives me peace of mind in case there is any changing weather conditions such as an unexpected headwind or rain, both of which require the car to use more energy. I also like to take unexpected detours, so having a little reserve permits stops like an unexpected fruit stand or a detour to an interesting place. For me road trips are more about the journey than optimizing drive time. If one is super intent on optimizing drive time on a road trip, the best solution is to arrive with 0 rated miles left in the tank, never detour off the road and always only take breaks at superchargers. Alternatively, a strong rumor exists that a battery swap station is being built at Harris Ranch at the site of a former car wash. Elon announced this technology a year and half ago! In the announcement, the demonstration took 1 minute and 33 seconds, which is faster than you can fill a tank of gas in an ICE. But battery swaps will not be free. Just this week a friend of mine who was traveling in an ICE talked to the construction workers there who said they were building a battery swap station, so I have pretty high confidence in this rumor. This entry was posted in battery, Car Wash, charging, Charging Stations, Model S, Superchargers. Bookmark the permalink. Really useful data: thanks! I note from the second graph that if you’re really conservative about your desired range buffer, you may well benefit by driving a little slower than the highest speed limits you may encounter on the Interstate system.